It’s 5:30 am on Forest Road 050, five thousand feet high, deep in Umatilla National Forest, Oregon. I lay wide awake, huddled between my new fluffy quilted comforter and flannel sheets listening to the rain pelt my thin RV roof for the second night in a row. For three days it’s has been nearly constant: relentless, loud and cold. Anxiety swirls inside me as the wind swirls outside, rocking my tiny home. I squeeze my eyes shut, trying to push away my anxiety and go back to sleep. But I can’t. I toss and turn; sleep alludes me as the nasty noisy weather steals my comfortable silence. The wind rips through my awning and I regret putting it out yesterday when the clouds finally separated, revealing slivers of blue sky and hope for sunnier days. 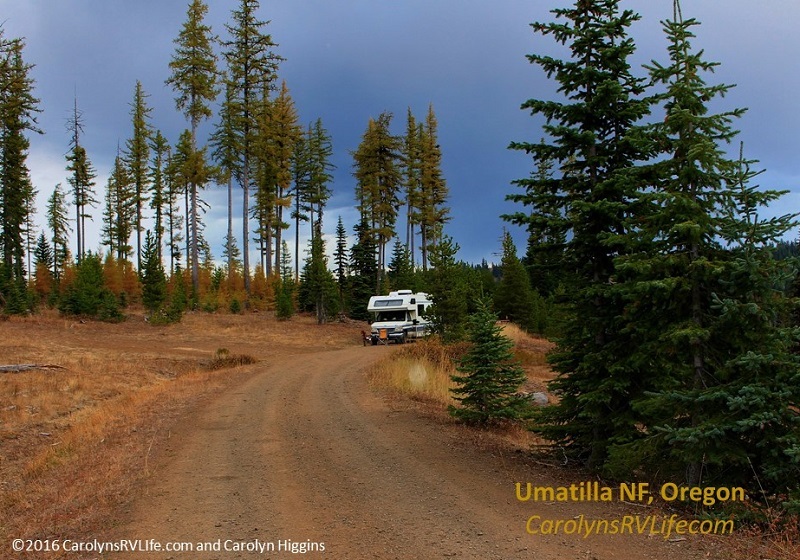 I arrived in Umatilla National Forest in the Blue Mountains of northeast Oregon, seven days ago. The National Forest is “1.4 million acres of mountainous terrain and deep v-shaped valleys” (source: Forest Service website). I found a picturesque, open, and spacious campsite (with 2-3 bars of 4G!) on dead-end forest road 020 (off of highway 204, 13 miles north of Elgin). The secluded spot, overlooking a small valley, beckoned, “stay. You’ll be safe here!” And how could I refuse! 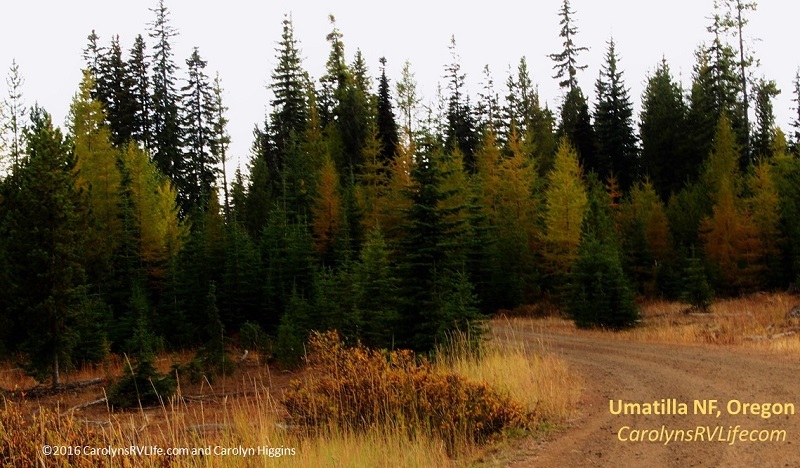 Surrounded by a forest, thick with a variety of conifers; Pacific yews, Western Junipers, Spruce, Firs and Ponderosa, Western White and Lodgepole Pines. I was in awe of all their different shapes and sizes and how they decorate the forest in layers of fall colors and contrast. It was gorgeous. Ahhh I found my new temporary home! When I arrived, the sky was heavy with rain clouds. Occasionally, they’d open, spitting showers upon Capone and me as we explored the web of forest roads on foot. But they’d just as quickly close back up and allow the sun to break through and warm me just enough… However, within a few days we were huddled inside escaping wind, biting cold temperatures and even hail and snow. And for the last few days, instead of reveling in Mother Nature’s beauty, I’ve been huddled inside, escaping her. I love the rain— or at least I thought I loved the rain. On backpacking trips, I’ve been beside myself with excitement; huddled inside my tiny tent as storms delivering earth-rumbling thunder, sky-piercing lightening and pelting hail rumbled over me. All my life, (yes, even as an adult! ), I’m always the one to run outside and skip through mud puddles during thunderstorms. My ex-husband thought I was insane the first time I experienced a (rare) thunderstorm in the Bay Area (one of the things I missed the most about growing up in NY) as I ran outside to stand in the driveway and watch as it pass overhead, giddy with excitement. As a backpacker, I’ve reveled in ‘being One with nature” and “weathering the storms”, hell, I even blogged about how nature isn’t supposed to be easy and convenient – and how I welcome all that she is! (Read it here: Alone on the JMT – my 26 day, 256 mile hike). And now I lament: oh how easy it is to tolerate – or even love – a challenging situation when you know there’s an end (or you can go back inside and escape it!)! A few hours huddled in a tent while a storm passes over is one thing, but days and days of gloom, air thick with cold and damp, constant noise as rain thrashes my tin-box home and the constant worry that the tenuous seams of my old RV will burst, leaking water down my walls, is a whole other matter. I think the reality of RV life is starting to settle in… it’s not like living in a sticks and bricks house where I’d have the luxury of peeking at the storm through a window, muting the TV so I can hear the rumbling thunder, or bundling up and stepping into the driveway to watch it pass over before retreating to the comfort and safety of a home that doesn’t rock in the wind or amplify the sound of raindrops on the roof. I don’t even have a radio or TV to drown out the sound of the rain and wind attacking my RV-home. It’s just me. Alone. In a tin box. In the woods. Fifteen miles from civilization. With just a tenuous layer of particle board and sheet metal between Mother Nature and me. This is pretty real! 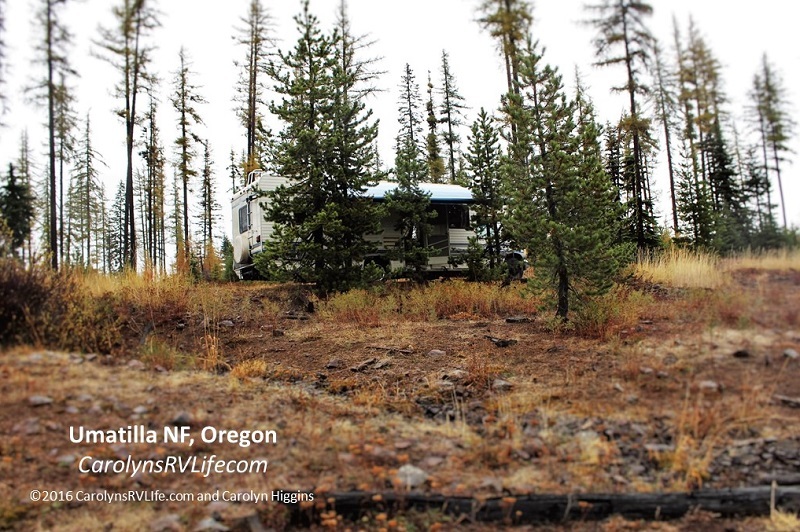 Part of my motivation for living in an RV was to be closer to nature. To immerse myself in her rhythms, innate ruggedness and breathless beauty. Last spring – California’s first ‘normal’ rain year in a while- during one of my “practice” boondocking trips in the El Dorado National forest, I got to experience my first RV rain storm. I reveled and delighted at the sound of rain drops pelting the metal roof, sitting under my awning, watching the drops bounce off the drought-hardened earth and throw tiny splashes into the air. It was so new and exciting then…. Now it’s my reality. Feeling disappointed in the weather – and myself – I conceded. The rainy season has hit Oregon and it’s time to move on. And now I just lay here wide awake impatiently waiting for daylight to crest so I can break camp and nohead down the mountain to dryer ground. Life in an RV is different. We don’t have the comfort and security of sticks and bricks. We’re more exposed and vulnerable to the elements. It’s why I chose this life and now I’m disappointed that it’s what’s causing me stress. I hope the longer I live in my RV and the more I trust in her condition, the more comfortable I’ll be; knowing that I can literally weather the storms! 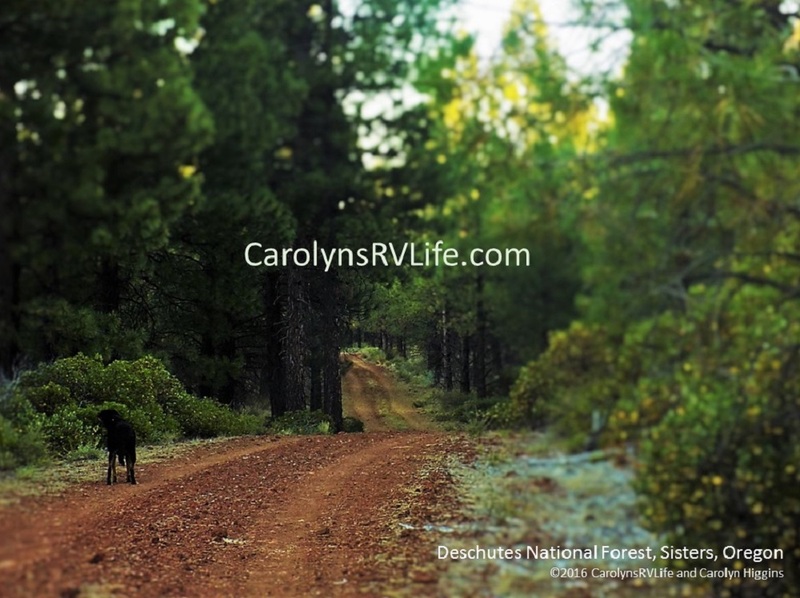 We Location Independent RV- Living Nomads have a saying: “If you don’t like your neighbors, move.” And lately my “neighbor” has been an unrelenting nuisance. So it’s time to bid adieu and find more hospitable ones. 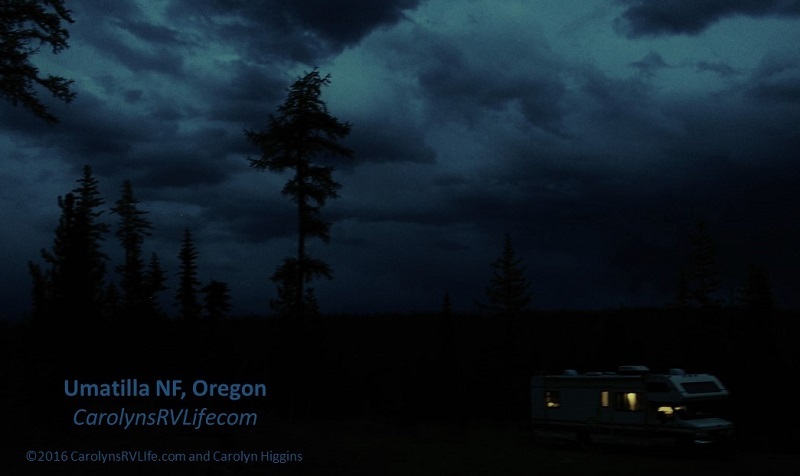 Share: The Rainy Season Hits Northern Oregon – With a Vengeance! 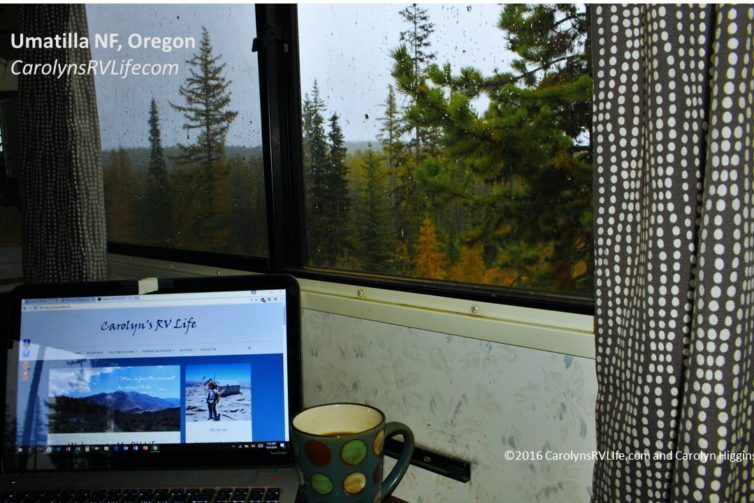 Carolyn, I think you are very brave in your RV in the forest, in the rain. 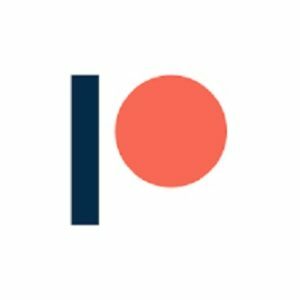 I lived in Oregon for a very short time through the winter. We were in a mobile home and it was scary at times. I think it is about getting used to a new norm which is always changing in your case depending on where your at. I enjoy your blog, thank-you for your raw honesty. Did you see any mushrooms? yes, I did see a few. Big white ones. I just got into the magical world of Fungi. 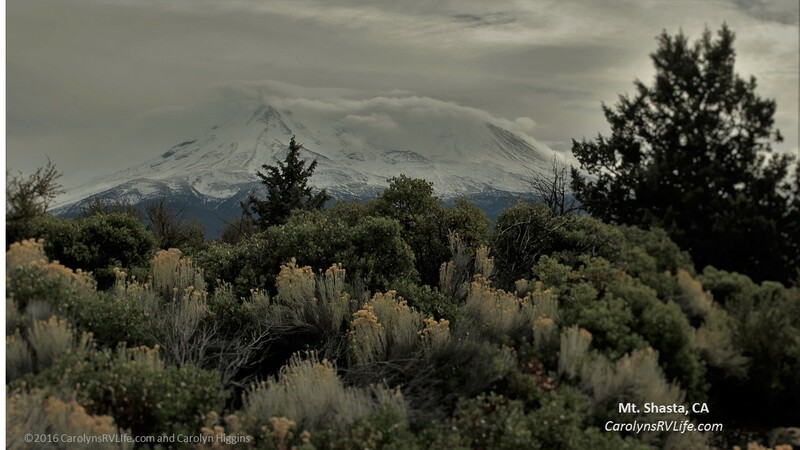 Oregon is one of the places on my list to visit. keep an eye out. Thanks for the detailed description of your adventure, and for including the gps coordinates for boondocking spots. It does get easier to trust your rig. I keep an 8″ roll of butyl tape by my door just in case I need to make a temp patch in the rain. Starting my 3rd year full-timing and I would never go back. butyl tape is similar to plumbers putty….maybe 1/2 inch wide, flat and in a roll…..great for sealing seams. holds up in weather. What a great idea, Mike. I think I’m down to to about 5′ of Butyl tape, so I’ll stock up. Thank you so much Carolyn for the awesome description of your adventures. Safe travels as you return to the Bay Area. I enjoy so very much reading your blog and hope to meet you on the road someday. I love the desert. It has 8 months of spring and 4 of hell. I live on the border of Arizona and California in Blythe. There is a strip of green that is next to the Colorado River. Temps are still in the 90F region in early October. After Thanksgiving they should be much lower and liveable for northerners. RV Snow birds are beginning to slowly arrive in October and will leave by March. It sure beats the cold wet windy northern California where I lived for 37 years….in Davis area. I used to own property overlooking Agency Lake, north end of Klamath lake. It can get bone chilling cold in eastern Oregon. Decided not to retire there. So true…one storm lover to another. I have both a home and RV for another couple months. Rain is such a precious commodity here in San Diego that when I know rain is coming I packed up my jammies and dog and head to the RV so I can enjoy the the storm. I can’t imagine living somewhere where the storms would become a nuisance, however after reading what you wrote I begin to get the picture. Hi Carolyn. I’m glad you weathered the storm. Every time I’m in a big rainstorm in our Class C I get a bit nervous about leaks! I guess it’s just part of living in a RV. We are in a too loud campground this weekend and I can’t wait to leave tomorrow and head someplace peaceful. I look forward to seeing you at Quartzsite at the RTR. Hi Carolyn. We have just started our full time rving experience a few weeks ago. We are visiting family on our way down south (Florida) to establish our domicile. We will leave there the end of November and head to Quartzsite where I very much look forward to meeting you at the RTR. 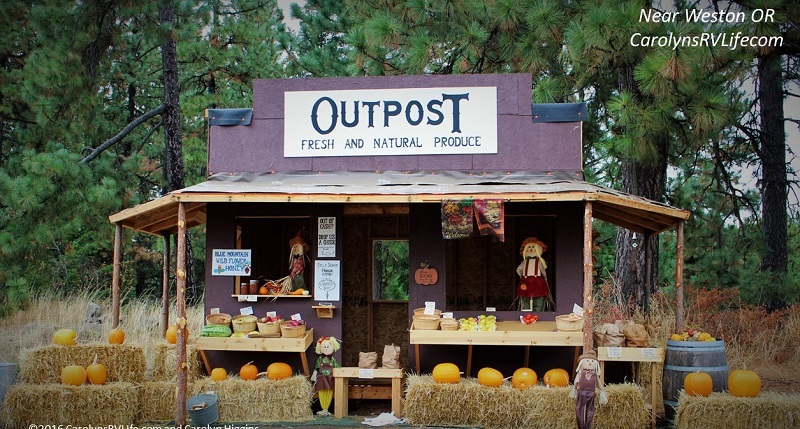 Our plan is eventually to do lots of boondocking in the desert, national forests and other places. I hope someday to start a blog and I truly love reading yours and look forward to us being friends someday. Your posts are well worth the wait, filled with the textures of life that should be in enjoyed, experienced and occasionally endured, Life doesn’t come with a manual, those Lucky enough to live life on there own terms and then to share it enriches us all. As I read along you take me to a range of emotions from, I Can do that sounds simple enough, to what did you expect, to OMG I never saw that coming, too I would probably do the exact same thing. I so wish you could write a book, your posts are just so colorful and you truly have a gift with words. So great to have another blog post from you. It certainly is an adjustment, having to change and think about what kind of comforts you want and can’t deal with. Hope you are able to find somewhere a little warmer and less rain before it starts pouring buckets. Get in and out of the Bay Area quickly and best of luck selling your car. Thank you for your kind words and encouragement! I appreciate that very much. Oregon is cold and rainy. I’m back in Sisters now which is a bit better than Elgin, but tomorrow the rain comes and stays for at least a week. And last night the temps dipped in the high twenties. My friends are heading to the Nevada desert and I’m heading back to the Bay Area for a couple of weeks. Like you, I can’t deal with the rain and cold too long.. for a few days it’s fine, but being cooped inside burning my propane – not fun! I do hope to get the car sold quickly- being back will be a shock to my system. thank you so much for sharing your thoughts and continuing to read. Really enjoying your blogs, Carolyn! Hang in there and let me know if I can help in any way while you are here in the Bay Area. in michael moore’s last video, he interviewed womyn leaders in iceland, where feminist principles run the country…they even consult faeries before building roads and bridges in natural areas! !…when he asked one of the womyn what she had to say to americans watching this movie, one of the womyn leaders said, “i would never live in america…you are too ‘me’ oriented and we are ‘we’ oriented”…. i agree with your word ‘narcisisttic’…i believe we have bred a nation of highly narcisistic, masculine-principled materialists and we can all see where that “dream” has taken us! i am very inspired to watch those like you and bob forging new frontiers in our falling-apart/dead-end value system… i hope you both take good care of yourselves and find plenty of alone/Earth time while doing this! Water is the nemesis of your RV. While we all need and appreciate water and rain, it can cause some serious damage to your RV that is going to be expensive to repair. That’s why RV Roof Magic protectant is one of the best ways to protect your investment.